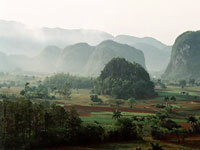 A recent addition to the UNESCO World Heritage list, the town of Vinales, and the valley in which it is set in Cuba's 'green' Pinar del Rio Province, is characterised by impressive round-topped hills, or mogotes. These date back to the Jurassic period and are covered with rich and varied vegetation; they are remnants of the plateau that was eroded by a network of underground rivers millions of years ago. The Vinales Valley is located about 112 miles (180km) west of Havana, making it a good daytrip destination or weekend getaway. The valley is beautiful, a patchwork of nature's bounty mixed with green fields of tobacco, coffee and other crops that grow out of the rich red earth; traditional agricultural techniques have remained unchanged here for centuries. Scattered palm trees and pine forests shelter a variety of melodious birds, and the area is also a magnet for speleologists and cave enthusiasts, being riddled with limestone caves and caverns. The hilly landscape, quaint villages, oxen-ploughed fields, rustic barns and underground cave systems and rivers, provide a striking contrast to the faded colonial grandeur and white sandy beaches found on the rest of the island. The main valley village, Vinales, is a charming, very laid-back place that makes a good base for exploring the lovely surrounds. We are looking for contributors for our Vinales Valley travel guide. If you are a local, a regular traveller to Vinales Valley or a travel professional with time to contribute and answer occasional forum questions, please contact us.